Frederick City is considering authorizing speed cameras this year, with the majority of City Aldermen voicing their support for the proposal at an October 7th Meeting. If approved, Frederick would be authorized to collect net revenues equal to 10% of its current budget -- about $11million/year after the contractor's cut, assuming the same % as Montgomery County pays, or about 8 tickets per resident of the city per year --- at the expense of residents' constitutional right to face their accuser and be considered innocent until proven guilty. Donna Kuzemchak and Marcia Hall were both quoted by the Frederick Post supporting the cameras. One Alderman David Koontz expressed his desire to push the limits of what the law allows and then request the restrictions be lifted by stating 'I think it's ridiculous we can only have them in school zones'. 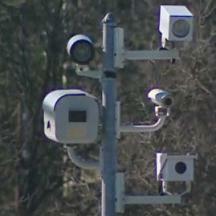 Police Chief Kim Dine said the half-mile radius and the number of schools in the city would create a large area for cameras to operate, indicating this is OK with him. The schedule of upcoming city meetings can be found HERE. The Board of Alderman's next public meeting is scheduled for October 15th. The Members of the Board of Aldermen are all up for re-election on November 3, 2009.